I need to review my habit of going to the cinema and buying tickets in Row A. I choose to sit at the front, partly because I am a bit myopic and partly because if I don’t sit there, someone with a big head will come and sit directly in front of me. However, Row A and the pre-film warning about bloody violence should be enough to persuade me to move back to Row D.
But it never does. I still spend the gory moments peeking between my fingers. 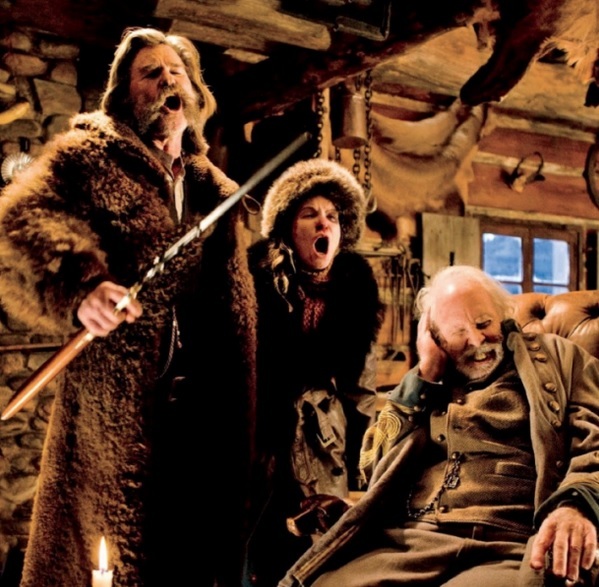 And ‘The Hateful Eight’ doesn’t disappoint with its gory moments. A Tarantino film is always a big deal to go and see, because his other films have been so ground-breakingly creative and quirky. Expectations are always high. ‘The Hateful Eight’ takes place inside a stagecoach during a snowstorm in Wyoming, and then most of the film is set inside Millie’s Haberdashery, which is a stagecoach lodge. It is some time after the American Civil War, maybe in the 1880s or 1890s. 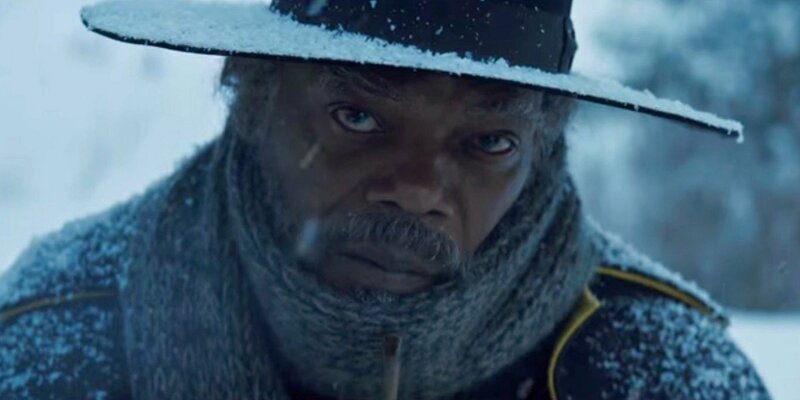 The premise is that a bounty hunter, John Ruth, is bringing in a murderer, Daisy Domergue, to be hanged in the next town. The drama comes from the fusion and interaction of the characters in the lodge and the constant undercurrent of tension that Daisy will be aided by one of the other characters to make an escape. The film is divided into six chapters and the action revolves around the enigmatic character of Samuel L. Jackson as Major Marquis Warren and the rapport, stuffed with farcical dishonesty and machinations, between a strong cast which includes Tim Roth, Kurt Russell, Jennifer Jason Leigh, Mark Madsen and Bruce Dern. Walter Goggins as Sherrif Chris does a plausible impression of Jim Carrey throughout the whole film and it is good to see Channing Tatum featuring in a slightly more demanding role as bad boy, Jody. The action is bloody beyond all expectations and, as you know, I will never offer spoilers, but there are scenes where other directors may have offered a murder with a pint of blood and Tarantino will give you a truck load, complete with recognizable bits of brain. It is definitely the hyperbole of violence which makes those moments horrifically and hysterically funny. Tarantino has always been the master of using music as a quirky semiotic in his film and there is a great moment where Bob the Mexican plays Silent Night on the piano during a scene of mischief. Ennio Morricone’s soundtrack is cheekily used to make moments impactful, too. For me, two things make this film great. Firstly, Tarantino’s ability to mix shock and the unexpected with credible twists and turns. I spent little time wondering what would happen next or trying to predict outcomes, as I was so involved in the moment of the storyline. Secondly, the action is so fast-paced and when the story does slow down, the skilful acting makes each moment a morsel of brilliance. For example, Samuel L Jackson has a monologue about killing a white man: I won’t spoil the excitement and tell you who it is or when, but just take a moment to listen to the arrogance, the hubris, the lethargy and the resentment in his voice. Superb! It is part of Jackson’s repertoire of moody moments throughout the film which make his character effortlessly brilliant. The same is true for the other actors. Roth is a genius: you dislike and distrust him before you know what he is. Madsen and Jason Leigh are multifaceted and interesting and Demian Bichir as Mexican Bob is hilarious. Add to the superb acting Tarantino’s gift for keeping an audience in suspense then throwing the unpredicted into the mix, and you have a great film. There are moments of sheer brilliance: the rough rapport between Russell and Jason Leigh, filled with almost unnoticeable seconds of tenderness; the symbolism of Major Warren’s letter from Lincoln, the snowstorm outside and the crackling heat inside the lodge. The flashback to ‘what happened before’ is as exhilarating as it is elucidating and moments such as the coffee, the ‘huevos’ and the final ending will stay with you for a long time. You will know Tarantino’s style by his previous films. This one does not disappoint. It surprises, it shocks, it provokes thought: it is at times a bit uncomfortable and at times it makes you laugh perhaps when you shouldn’t but, above all, it goes way beyond the visual spectacle of white snow and red blood and it offers some stunning performances from some well cast and superbly directed actors. It has venom and intelligence, wit and mischief. It is a drama which takes place in a single room, but this isn’t Chekhov’s ‘Cherry Orchard’! Go and see it. Get row A!